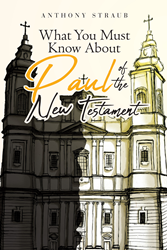 Recent release “What You Must Know about Paul of the New Testament (This Isn’t Your Typical Christian Message)” from Page Publishing author Anthony Straub is an examination of the biblical and historical, inspired by a sincere warning from the Son of God about Paul of Tarsus. Anthony Straub, a Michigan native who graduated with honors from Liberty University and is currently pursuing his Master of Divinity degree, has completed his book “What You Must Know about Paul of the New Testament (This Isn’t Your Typical Christian Message)”: a meticulously researched work illuminating the life, legacy, and contradictions of Paul. Published by New York City-based Page Publishing, Anthony Straub’s book is an in-depth study of Paul of Tarsus, who is found predominantly in the New Testament. Readers who wish to experience this thought-provoking work can purchase “What You Must Know about Paul of the New Testament (This Isn’t Your Typical Christian Message)” at bookstores everywhere, or online at the Apple iTunes store, Amazon, Google Play, or Barnes and Noble.